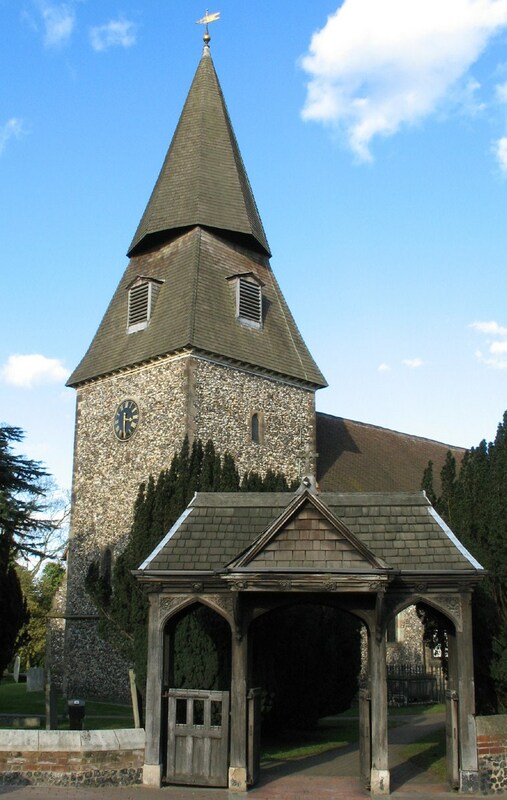 The parish church of St Mary the Virgin has been a continuous place of Christian worship for over eight hundred years. The church probably succeeded an earlier Saxon church on the same site. This was mentioned in the Domesday Survey (or census) in 1086 as a 'church in Bixle' where it is said that St Paulinus came to preach. The parish at one time included four of the present neighbouring parishes. Today the congregation on Sundays is about one hundred and ten, in an ecclesiastical parish of about five thousand people. This one time farming community is now completely surrounded by suburban south-east London. The centre of Bexley still has village characteristics of which the residents are proud. The church sits on a relatively large site which is park-like in character. There are a variety of 17th to 19th century memorials contained both inside the church and in the churchyard. There is also an adjacent cemetery which is now maintained by Bexley Council as a conservation area. The current interior of the church dates from 1883, the last great make-over completed by the Victorian s. They expressed through wood and stained glass their confidence in the orderliness of creation and their own place within it. 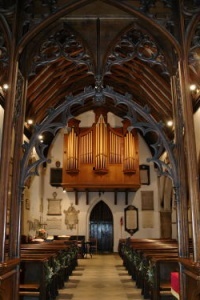 As such there is a raised altar some distance from the people, a formal choir space copied from the great English cathedrals, and the congregation are seated beyond the choir in ranks of pews. Reserved seats were marked for the families and servants of the local gentry. The whole effect was meant to enable the formal ritual which was characteristic of the high church revival in England in the latter part of the 19th century. In Norman times the church was a simple collection of three boxes - tower, nave and chancel. The church had wooden floors with benches around the outside for the elderly and infirm (hence the phrase 'going to the wall'). There was an altar on the same level as and near to the people. With prosperity in the 14th century the church was enlarged with the addition of the north aisle, as was the fashion. The wall seating remained because as the centre of village life (being one of the largest and sturdiest buildings in the district) the church was used for all sorts of activities, including market days. In about 1500 a screen was installed as Protestant tendencies began to filter through the church on the continent and in England. This separated the clergy from the people, and emphasised the class and educational differences between the two. It was a style copied from the monasteries, with the monks sitting in choir, where faith and learning had been preserved during the Dark Ages. The church itself may have had connections with Lesnes Abbey to the north, which overlooked the Thames River valley. In the north aisle was the Lady Chapel. The walls had no monuments but were probably decorated with paintings of the Virgin Mary and the saints directly on the walls. This taught the illiterate the Christian faith through visual means as an aid to devotion. The church would have been very bright and light, because there was only clear glass in the windows. There would also have been gravestones in the floor. Towards the end of the 17th century the screen came down as ecclesiastical fashion changed again. 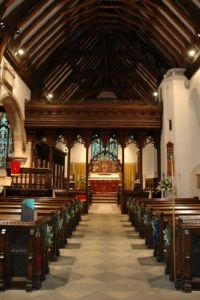 Pews began to make their appearance within the church. By the early 19th century the last of the medieval choir stalls had gone. There were box pews which were especially favoured by the gentry for their privacy. Monuments began to appear on the walls and there is even one to the Queen's great great grandfather which still remains. In 1883 the church underwent a significant make-over in an attempt to meet the needs of Tractarian or Anglo-Catholic preferences to return the church to medieval style. At the same time Victorian hierarchical values were maintained and the end result was far from the simplicity of the medieval period. All of the windows were replaced with stained glass and flint cladding was added to the external walls. In this century the building is changing again to meet the needs of today's worshippers. The Lady Chapel has recently been developed to provide a flexible open space without pews but with movable chairs and altar. 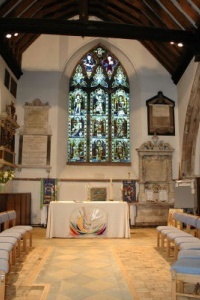 The space is used for informal and smaller services of worship. All on one level it emphasises the presence of God in our midst, to whom all have access through Jesus his Son.